American Girl Doll Play: Doll Craft - Make Your Doll Flip Flops! Doll Craft - Make Your Doll Flip Flops! Be sure to let us know if you make a pair of flip flops for your doll using funky duct tape! We would love to see how they turned out! Wonderful tutorial Jen and Zoey! Love it! Mallory and I will be making these for sure! What a great idea! Soooooo darling! What adhesive do you use? Love these, definitely making them for my neice! What glue did you use? I found a similar pattern online which I made for my daughter--it involves knitting the toe strap and then using craft foam as you did--but I think I'm gonna go back and add the foam trim around the edges. Yours looks so much more finished ... and I may have to try the duct tape version as well--too much fun! wow!!! this is so really cool and unique i will definitely be making these shoes! i am gonna make these on my 7th bday. they are really cool. 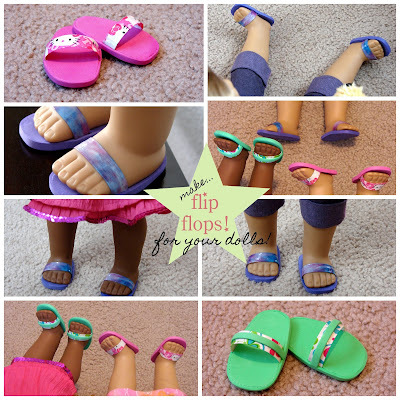 What a cute and easy idea for flip flops for 18" dolls. Thanks for the tutorial. You have some really cool stuff on this site. Thanks for sharing. Awesome!! I'm going to use it foe my sleep over party! Used paper instead of foam, worked the same. These are so cute! What adhesive did you use? Thanks for sharing! Love these! I'm definitely going to make some for my dolls! I love these. I'm realy going to try this next summer. These are great! What adhesive did you use?